Discussion in 'Hardware' started by LeDelmo, Sep 19, 2018. I wanted to make this thread as a means to do a direct comparison between the available B450i Motherboards. I also like Buildzoids quick observation on the B450 boards when they were announced. Now, I am definitely not the person to do a proper strengths vs weaknesses comparison between these boards. So, I would like to open this subject up to those who are more informed. To be able to post there thoughts and opinions on the subject to help benefit others. I am interested in hearing other people's opinions on this also. I like the asrock board, but that CPU connection location is odd. The Asus is too expensive, but I like the dual M.2 slots. The gigabyte one has gotten pretty good reviews I think. I have the ASRock board paired with a 2400G (see HTPC link in my signature). I've got a Noctua NH-L12s coming this weekend I plan on replacing the stock cooler with. I will be attempting to overclock my 2400G. I really like board. It has all the features I could possibly want (except a regular USB-C port instead of Thunderbolt) and the layout is great and the BIOS has been a dream to work with. ASRock's "Fan"Tastic tuning is great - automated BIOS tuning of fans attached to the motherboard headers to find the minimum voltage needed to get them to spin and custom fan curves. If you have any questions about this board paired with an APU, feel free to ask! Soul_Est, TheHig and LeDelmo like this. I would love to hear your thoughts on the 2400G in the ASRock board. I was really impressed with Buildzoids break down of the B450 boards especially considering he is merely going off Photo's. But, a detailed in person break down will always be more informative. As far as myself. From what I can see. 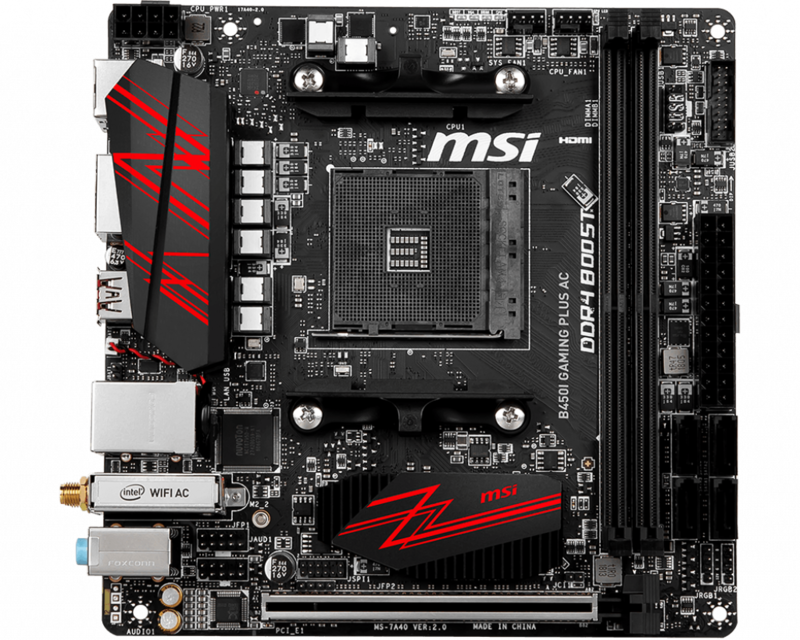 The ASRock and MSI are the two best boards when looking at the components used. I really like the ASRock io. And I really like the heat sink/VRM of the MSI. I haven't really seen anything on the Gigabyte so I can't comment on that one. But, the Asus is really throwing me for a loop. People are making some bold claims about it. Yet, the thing really doesn't impress me with it's build. Though, it is the only one with dual M.2. I'm torn between the Asrock and Gigabyte boards. They both look very good to me. ASUS has been gradually lost me with their board layouts and features recently, and given the asking price they want. I'm rocking the ROG STRIX B450-I Gaming. Ask me whatever questions you have. If anything is wrong please contact me and I will update accordingly. NateDawg72 and Soul_Est like this. I was surprised to see the Asus VCore and SoC were different. Where as with all the others I couldn't see anything that would imply a difference between them. Are the Asrock b450 and x470 using the same VRM components? I'm asking since the x370 and the b350 didn't. Aside from that. I have the x470 Asus board and it's ok (for the price, would be great for less). You could run 3 GPU's from it with the right risers and the bios is most likely the best one out of the bunch. But it's the worst for APU's. I also have the Gigabyte b350 and that seems to be similar to the b450 in terms of features. The bios is functional and with the b450 revision the VRM seems to be cooled well enough. This would be the board I choose personally for an APU build, since the SOC phases are also cooled. I had the b350 from MSI at my workplace and the bios was bad. Since the other b450 boards from them don't seem to have better bios, I can't recommend it for APU builds and people that plan to tune using PBO. Can't say a lot about the asrock boards, never had one. If they get bifurcation to work they could be a good alternativ to the Asus board for people considering more expension slots. Honestly, finding anything on the ASRock boards was really hard for some reason. I couldn't find anything off the website so I had to look around allot and that's what I found. Kinda disappointed with the available AM4 itx boards in general. 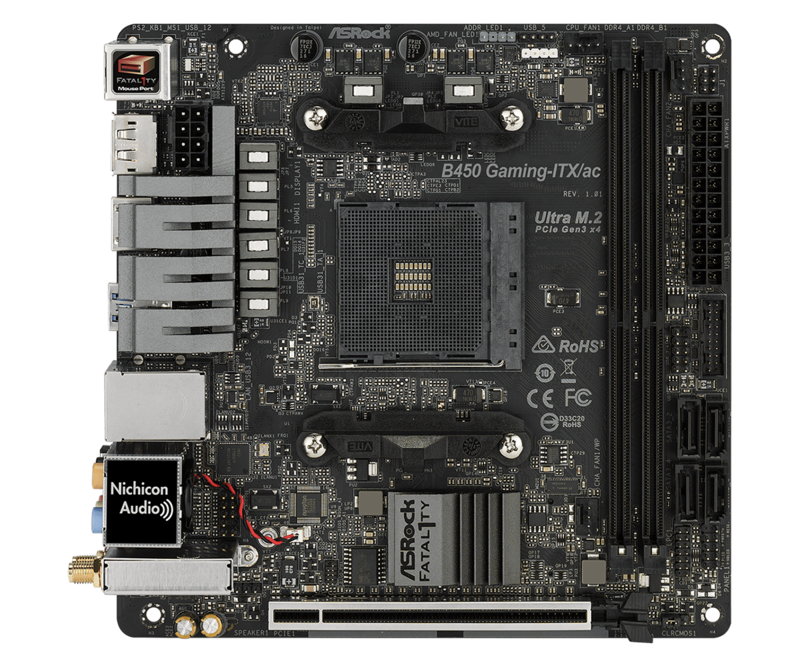 Especially, when Biostar and ASRock are the only two offering options for a Toslink connection and USB-C. AM4 itx boards in general just seem to be inferior to the Intel equivalent. Most of the intel Boards just seem to offer more for io and are even offering better heat-sinks for both the VCore and SoC VRM's. TeutonJon78 and Soul_Est like this. I feel like I have had pretty good luck with my x370 itx (asrock) - if I bought another one today, I would buy the Asus, solely for 2x M.2. Is there good clearance on the board to mount this CPU cooler? https://www.titan-cd.com/en/product...1.5U-Height-TDP-130W/TTC-NC25-Series.html#INQ I'm not sure if the it would fit to get the fins to fit parallel. Are you able to have the fins be parallel if you have the Noctua nh L9a. I have the L9a on my x470i strix and it can only be mounted with the air blowing into into the RAM. I also have the titan cooler, but I don't have the am4 mounting kit. When I were searching for a cooler, I eyeballed it and I doubt it would go in parallel, even if the mounting braked allows it, which I also doubt. Good questions there. My main question is, "Mount the heatsink with teh fins parallel in relation to what? The RAM slots or the PCI Express card slot?" I have my L9a-AM$ mounted the same way that @Aki has done below. The Titan may be the same way as it's overall footprint is more rectangular like the L9a-AM4. Same here with the L9a-AM4 will you be mounting a 3rd party heatsink on the VRMs to take advantage of the airflow from teh L9a-AM4? I was thinking of either getting a set of copper mosfet heatsinks or one with actual vertical fins. Shame that the heatsink blows into the ram. I don't think temperatures are affected that much from it though. Are there heatsinks for the vrms that you guys removed? On my z270i I removed some because they blocked airflow. I have both the Asus Strix and ASRock Fatal1ty linked in the original post. Haven't decided which one to use, leaning towards the strix. I was planning on getting the L9a but if the only orientation is perpendicular to the ram maybe the L9i with the NM-AM4-L9aL9i mounting kit is a better option. I think the biggest difference is the dual m.2. I have an S4 mini, so being able to eliminate cables is always a plus. I agree on the orientation of the cooler though. Maybe the ASrock board let's you mount it parallel to the ram. It seems like the orientation of the cooler mounted is rather the debated topic. Though, I wonder if its as people say. I mean the main issue people have is about the fins blowing hot air into the Ram slots correct? But, I honestly question the air is getting that hot and is being passed on to the Ram slots. You would almost think any air flow over the Ram sticks would be more beneficial than anything else. Even in a Hot running system. I cant really see the heat transferring into the air that is being passed over the Ram sticks. Someone should test this out though. And do a thermal check with both orientations of the cooler while the system is running hot. Someone should test this out though. Someone kind of did. Not the orientation thing though. The 120 low profile fan on the skybracket seems like the way to go on AM4 with the L9a. This isn't scientific by any means, nor am I sure it happened because of this, but the heatsink for the top m.2 slot on my Asus z270i actually came off. I honestly don't remember removing the screws on the bottom for it. I was using the lp-53 and the fins on the cooler had to be perpendicular to the RAM. I agree with the guy above me though. Using a 120 mm fan with the L9a is probably the best best. I think the bigger fan would allow some more air to move in the case and could help the ram stay cooler .